Neovascular glaucoma (NVG) is largely a devastating ocular disease with highly elevated intraocular pressure (IOP), which is refractory to both medical management and surgical intervention, and finally corrodes off patients' residual visual function. In other words, NVG is a potentially blinding secondary glaucoma that may derive from numerous underlying ocular or systemic diseases which share one common element: retinal ischemia/hypoxia and subsequent release of angiogenesis factors. It has been long time an intractable problem to manage NVG in clinic and often resulting in patients' serious subjective symptoms represented/characterized by intolerant pain. There has been tremendous progress in glaucoma management, but how they go with NVG and where are we now on the way of handling NVG? What we can do now and what we could do in the future? This review article about NVG will include an abbreviated introduction from the aspects of its pathophysiology, histology, clinical staging, and then mainly discuss about the management and treatment in the future. NVG was defined as the presence of iris and anterior chamber (AC) angle neovascularization with elevated IOP, but IOP much >21 mmHg. Poor control of diabetes mellitus and hypertension was once generally considered the most common risk factors for NVG. Critically, based on the amounts of investigations and experimental researches, the pathophysiological basis of neovasculature (NV) or NVG is retinal capillary nonperfusion, retinal ischemia, or uveal capillary insufficiency caused by various primary or secondary diseases, such as proliferative diabetic retinopathy (PDR), ischemic retinal venous obstruction (RVO), ocular ischemic syndrome (OIS), and some uncommon ocular causes such as uveitis, ocular tumours, and miscellaneous retinal diseases. In contrast to original compensation, the neovascularization brought pathological disaster rather than improving circulation to the eye. 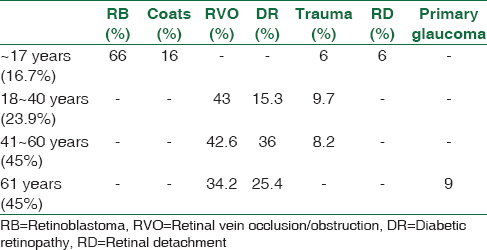 Around 40%~45% of ischemic retinal venous occlusion eyes would develop NVG, and 80% of them would happen within 6–8 months, especially in the first quarter., For PDR patients, there are 22% suffered NVG, majorly bilaterally; intraocular surgeries such as cataract surgery or vitrectomy would promote NVG progressing in DR cases. As to OIS, NVG can occur in about 68% eyes and the risk increases with the length of time between symptom onset and diagnosis, as well as with the severity of ipsilateral carotid artery stenosis. Having reviewed 301 cases of NVG in our department during the last 10 years, we found that there are >40 different kinds of diseases related to NVG, even local radiation therapy of nasopharyngeal carcinoma, which might compromise retinal circulation and induce retinal circulatory disturbance. 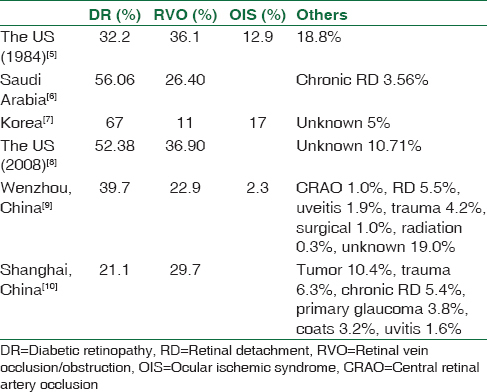 Previous studies have reported the prevalence of NVG post various ocular diseases related to retinal ischemia and also the constituent ratio of these etiologic diseases contributing to NVG. There seem some subtle disparities of both prevalence and constituent ratios among different countries or races as shown in [Table 1]. The most common primary etiologic associations for NVG included PDR, RVO, OIS, and some other chronic ocular diseases. Here, we also present the constituent ratio of the main causes of NVG in different age groups collected in an ophthalmological hospital in Shanghai between 1993 and 2002 [Table 2]. We think that there should have been some alteration happening in the past 15 years, a new investigation needs to be done in the future. All those diseases mentioned above caused NVG through certain specific molecules. Most of these related endogenous molecules derive from the posterior segment and are transported into the AC and result in an altogether disturbed microenvironment within the eyeball. Vascular endothelium growth factor (VEGF) has been recognized the most important factor to neovascularization. Besides verifying the highly elevated concentration of VEGF in the aqueous humor of NVG eyes, Yu et al. had revealed increased levels of hepatocyte growth factor (HGF), transforming growth factor-beta1 (TGF-β1) and-beta2 (TGF-β2) in the aqueous humor of patients with NVG by enzyme-linked immunosorbent assay, along with highly expressed TGF-β1 and-β2 in the neovascular membrane, iris stromal cells, and ciliary cells by immunohistochemical staining. Tripathi et al. also confirmed the higher levels of TGF-β1 and interleukin 6 in patients with refractory NVG secondary to PDR. Furthermore, it was also found a possible involvement of basic fibroblast growth factor (bFGF) in the pathogenesis of NVG. TGF-β was supposed to promote the fibroblast in the neovascular membrane proliferating and constricting. However, the role of HGF and bFGF in NVG is still unknown. There may be some relationship between these factors or between VEGF and them, and one possibility is that the neovascularization is affected to a large extent by an unbalance between pro-angiogenic factors and anti-angiogenic factors. We think more studies need to be conducted to reveal their inner connection. Because it will help to explain not only some aspects of the pathogenesis of NVG and the high failure rate of surgeries on NVG eyes but also come with a great referential value for all other ocular neovascularization diseases. The clinical sign of NVG is the development of a fibrovascular membrane on the anterior surface of the iris and the iridocorneal angle of AC. Membrane development is followed by the development of progressive anterior synechiae, and angle closure, and precipitous rise of IOP, which may be of fairly acute onset. Corresponding to the histological basis and clinical characteristics, NVG could be divided into three stages along its pathophysiological process. At the early stage, Iris NV (INV) can be found without elevated IOP, which can also be named rubeosis iridis. Patients are lucky to be found at this stage because INV is the sign of ocular ischemia and reminds doctors to treat the underlying diseases. If treated appropriately and timely, those INV would regress, and the neovascularization process will be stifled without further visual function loss. This is a key stage to stop the development of NVG, but unfortunately less likely to be found in clinics. If the INV stage were missed, patients would go on into the next stage–NVG with an open angle. At this stage, a neovascular membrane has formed and covered the surface of both iris and anterior angle, leading to trabecular meshwork obstruction and dysfunction, and consequently high IOP. Histologically, the portion of connective tissue in the NV membrane is transparent and can contract because this membrane mainly contains proliferated myofibroblasts; while the NV consists of endothelium, which shares incomplete barrier function and high permeability to albumin and blood cells. A typical sign of this stage is ectropion uvea and poorly reactive pupil. This stage is usually short and will quickly go into closed angle stage. Once patients have stepped on this process, the dysfunction of angle drainage has occurred and would be irreversible. Furthermore, the neovascular membrane contracts and causes the contact between iris and trabecular meshwork, then the closure of the iridocorneal angle and stable goniosynechia sequentially. This stage is coming to NVG with angle closure, characterized by abruptly elevated IOP which is refractory and hard to control. There is almost no way to go except antiglaucoma surgery. NVG is almost invariably the main factor in irreversible and massive visual loss, rather than the original disease inducing NVG. Due to the fact that these patients' visual function has been very poor since their primary diseases, NVG adds insult to injury. More than that, the remarkably and abruptly high IOP leads to intolerable pain. Hence, the aim of treating NVG is both to halt continuous visual function loss and to release patients' intolerable pain or discomfort associated with NVG. Hence, we have to reduce IOP as soon as possible to retain patients' useful vision function and relieve their discomforts. Furthermore, there also need to eliminate or reduce the neovascularization as far as possible, so that to impede the pathogenic progress of NVG. Early treatment of those underlying diseases can reduce the prevalence of NVG. As mentioned above, PDR, RVO, and OIS are three main diseases responsible for developing NVG in the clinic. Hence, here we mainly discuss the management of these three conditions as follows. First, there is strong evidence that full panretinal photocoagulation (PRP) for advanced nonproliferative or PDR is the most effective way to prevent the development of NVG. Sometimes, it would be limited by opacity of cornea or lens in clinical practice to perform PRP. For RVO, especially central retinal vein occlusion (CRVO), even though it had been well known that ocular NV and NVG are a complication of ischemic CRVO but NOT of nonischemic CRVO, there have been some revolutionary updates regarding the treatment of ischemic CRVO to prevent NV or NVG in the past decade. Ischemic CRVO and PDR behave very differently in nature and course. Prompt and prophylactic PRP has been demonstrated to be null in effects to prevent angle NV and NVG. Although PRP would reduce the incidence of INV, more than two-thirds of INV does not progress to NVG. Paradoxically, PRP would compromise peripheral visual field and leave patients with poor visual quality and visual life years. Based on the result of a multicenter prospective clinical trial by “the central vein occlusion study” (CVOS) group investigating the role of PRP in ischemic CRVO, it has been set up as “gold standard” to carefully observe with frequent follow-up examinations in the early months of CRVO (including undilated slit-lamp examination of the iris and gonioscopy) and execute prompt PRP for eyes with 2'clock iris/angle NV developed., However, Hayreh has come up with some disagreement with the results and pointed out various limitations and flaws of this group's study. Although the CVOS group agreed with Hayreh's comments, management of ischemic CRVO to prevent NVG is still highly controversial, and it is also considered as “gold standard” of coping with CRVO before a much more reliable multicenter trial providing us more evidence. And clinically, for those patients with low compliance or hard to follow-up closely, prompt PRP when INV being found may also benefit. Third, OIS is most commonly caused by internal carotid artery occlusive disease. Although the management of OIS itself is still debatable, what can be confirmed is PRP cannot benefit these patients. In addition, for the direct reason of ocular ischemia is low perfusion pressure in the ocular vascular beds, which theoretically equals the difference between mean blood pressure and IOP. Since we cannot increase the mean blood pressure, lowering IOP to as low a level as possible can help improve the ocular blood flow. But what should be cautioned is to get rid of medicines decreasing IOP and systemic blood pressure simultaneously, such as topical beta-blockers eye drops and systemic mannitol. While the decision of treating the primary cause or not should be multidisciplinary with the involvement of a cardiologist and/or vascular surgeon, which can often be hard to make. For the IOP controlling part of this review, NVG from various causes was lumped together because of lack of enough evidence on the IOP management relating with each underlying disease inducing NVG. Medical strategies are invariably the first step to treat high IOP no matter in NVG or other kinds of glaucoma. Medication includes various medicines that are given either in the form of drops or systemically, alone or in combination, to achieve the best possible result. All kinds of medical treatments inhibiting aqueous humor production (β-blockers, α adrenergic, and carbonic anhydrase inhibitors), but not agents enhancing aqueous outflow, can be applied in NVG to lower IOP. However, NVG always profits from neither topical medicine but systemic medical hypotensive treatment such as mannitol administration. Moreover, it was supposed that prostaglandins may not provide much help for their pharmacological mechanism is on the uveal outflow, which had been covered by a transparent NV membrane. On the contrary, prostaglandin analogs may further breakdown blood-aqueous barrier and worsen intraocular inflammation. Cholinergic eye drops cannot help in NVG either with the open-angle or closed-angle stage, which might paradoxically bring adverse impact such as disturbing blood-aqueous barrier and exacerbating ciliary spasm, because the pathophysiology is totally different from primary angle closure glaucoma. Once patients step into this stage, nonsurgical methods always prove to be feeble. Nowadays, anti-VEGF therapy has become a hot topic in NV-related ocular diseases including NVG. Anti-VEGF treatment has been introduced into hospitals worldwide since 2006. Till now, several reports have emerged about the use of various anti-VEGF agents in NVG, i.e., bevacizumab, ranibizumab, conbercept, Aflibercept, VEGF-trap and so on. However, the effects are inconclusive. Anyhow, one thing for sure is after anti-VEGF injection, visible NV will regress or become invisible in short time, but would appear again before long if the underlying ischemic disease not handled. Therefore, at the rubeosis stage without formed NV membrane or NVG, anti-VEGF injection combined with PRP or other kind of methods treating the underlying original diseases could prevent patients from developing NVG. But if NVG has developed, anti-VEGF can only serve as adjunctive therapy and win a window for anti-glaucoma surgery rather than a method of treating NVG itself, because of its short-term beneficial effect. In other words, injections of anti-VEGF were indicated in cases where PRP was not sufficient to control NV if the view to retina was too poor to allow PRP or preoperative administration for patients needing glaucoma surgery to reduce intraoperative hyphema. Limited data are currently available on its role in NVG or glaucoma filtering surgery. It will be discussed more in detail later in the section of surgeries. When medication is not enough to control IOP, we resort to surgical treatment, for laser trabeculoplasty is not helpful in NVG. However, trabeculectomy with antimetabolites (mitomycin C or 5-fluorouracil), also known as conventional filtering surgery, shared a low long-term success rate in NVG (not higher than 33%) and fails mainly due to fibrous tissue obstruction (neovascular membrane seals internal ostomy and spreads into the filtering passage) or external scarring and conjunctival fibrosis (various related growth factors promote neovascular membrane proliferation), even with antimetabolites. That is why NVG is also called refractory glaucoma. There have a few literatures reporting the use of microstent EX-PRESS shunt in NVG. It is made of stainless steel, which is applied to ensure a new path for the removal of aqueous humor from the AC to the space under the Tenon's capsule. Although it has been demonstrated to be a safer and easier option for primary open-angle glaucoma with comparable IOP-control effects to trabeculectomy, actually it is not suitable for NVG angle closed stage as the progress of peripheral goniosynechia and short length of the shunt (3 mm). Even at early-stage NVG without angle closure, the success rate of EX-PRESS implantation is quite low if not controlling the underlying diseases. A recent survival analysis performed on EX-PRESS used in DR related NVG (with also earlier history of vitrectomy 23G for diabetic complications) and reported that the probability of surviving 12 months was very low (0%–11%) for failed blebs. Nevertheless, the reports of patients with the EX-PRESS implant were too few to detect any influence on success in NVG. The most widely used methods for treating NVG are the insertion of glaucoma drainage device (GDD) implants, i.e., shunt implantation, with relatively high success rate. Most used drainage devices include Molteno implant, Baerveldt implant, Krupin valve, and Ahmed glaucoma valve lately. The first two are nonflow-restrictive implants (open-tube drainage) and the latter two are examples of flow-restrictive. As we know, shunt implantation is also associated with various intraoperative and postoperative complications such as hypotony, hyphema, cataract, corneal decompensation, and the failure to control IOP as well as diplopia and transcorneal tube erosion because of the presence of a foreign body. Although conflicting claims exist about the success of different draining devices, it is certain that shunts with valve have largely reduced the rate of hypotony. Therefore, Ahmed and Krupin valves are more commonly used nowadays, and Ahmed possesses even higher acceptance and popularity. The author's group had once followed up 63 NVG patients receiving Ahmed glaucoma valve or Krupin valve for 2 years. The patients were averaged at 48.6 years old, with preoperative mean IOP at 53.6 ± 14.5 mmHg. Twenty-six of these NVG were caused by RVO, 16 by DR, 15 by retinal perivasculitis, four by serious ocular trauma, and two by other reasons. Forty eyes have visual acuity better than light perception (LP), while 11 eyes with LP and 12 no LP but with intolerable pain. Thirty-eight cases were allotted for Ahmed valve implantation and the other 25 eyes for Krupin valve implantation. “Complete surgical success” was defined as stabilization of IOP between 6 and 21 mmHg without anti-glaucoma medications, and “qualified success” if with antiglaucoma medications, however, no additional glaucoma surgery, severe complications, or loss of LP; “relief” as alleviating pain in those preoperative blind eyes. Surgical failure was defined as IOP <6 mmHg or >21 mmHg, deterioration of VA toward NLP, or needing additional glaucoma surgeries. At 1-year postoperative follow-up, 61% of them achieved IOP complete controlled, 15% partially controlled and 21% relief; while at the end of this 2-year follow-up, there still was 60% complete success and 13% qualified success, and 17% relief with mean IOP at 17.6 mmHg (all lower than 21 mmHg). Five eyes suffered surgical failure: one developed phthisis bulbi and four accepted additional surgeries. Our results showed that the total success rate was up to 73% during 2 years follow-up, comparable with those reported in literature (59%~71% at 2 years after GDD implantation).,,,, Moreover, most of the complications are as follows: shallow AC often combined with choroidal detachment (14%), blocked shunt tube in the AC by iris or exudates (13%), hyphema as vascular rupture or hypotonic errhysis (8%), and antedisplacement of tube caused by loose fixation or tissue rejection (3%). To avoid these complications as much as possible, we got some recommendations:First, surgeons could choose to puncture into AC at the place with relative less NV to avoid damaging new vessels. Second, do not touch the iris when inserting the tube into the AC with the aid of injecting viscoelastics into AC first, which also avoid reducing IOP abruptly. Third, do NOT compress the eyeball and NO pressure dressing during and after the surgery of puncturing AC and inserting the tube into AC. In addition, to avoid tube erosion postoperation, cover the tube part with a scleral flap or an allogeneic sclera graft before it enters into scleral tunnel, or perform a relative long scleral tunnel. Last but not least, fasten the implant's body or the “end plate” of the valve tightly to the equatorial sclera. One has to bear in mind that even GDD has higher success rate than conventional filtering surgeries, it has its own complications and limitations, and fibrovascular membrane can still encase the tube and lead to failure in controlling IOP. The role of intravitreal anti-VEGF injections in preventing and reducing the progression of neovascularization has been established before. It has been demonstrated a decrease in leakage from the iris vessels on angiography after anti-VEGF injection no matter intravitreally or intracamerally, which appeared to be a decrease in iris and angle NV and resulted in safer surgical intervention. GDD combined with preoperative anti-VEGF agents injection would help maintain residual visual acuity but not improve the long-term surgical success rate,, although changes in bleb vascularity have been reported. Unfortunately, these injections in patients, that lack proper primary prevention, are temporary measures. There are also reports of subconjunctival injection of bevacizumab for use in rescuing failing filtering blebs; however, the effects have not been corecognized, and the standardization of administration needs to be defined/investigated if effective. One thing should be mentioned is VEGF has several roles in physiological process such as VEGF165 and VEGF121 more directly affect angiogenesis while the isomer VEGF189 has more of an impact on fibrosis, and some other subtypes regulate conventional outflow facility.,, So that, different subtypes of VEGF and differential affinity of various anti-VEGF agents may someday be exploited further according to diverse treating goals. In general, cyclodestructive procedures reduce the aqueous humor secretion and thus the IOP decreases through partially destroying ciliary epithelial cells. There are several types of cyclodestructive ways depending on the cycloablative physical approaches, and the commonly used are cryotherapy, microwave heating, endoscopic laser coagulation, transscleral diode laser photocoagulation, and recently emerged ultrasonic coagulation. For easy understanding, we used “traditional cycloablation” to refer to all those cyclodestructive methods (no matter contact or noncontact ways) except high-intensity focused ultrasound (HIFU). Traditional cycloablative methods are often reserved for eyes with poor visual potential or when other surgical options have failed. Most of these classic methods are effective, quick, and useful for patients who are unable to undergo incisional surgery. However, these techniques are easy to learn but hard to control for its unpredictable dose-effect relationship, and the postoperative reaction is quite serious. Compared with that, the newly developed HIFU seemed less in destructiveness and has been claimed by a few published reports to be a safe and effective procedure for reducing IOP in patients with refractory glaucoma, without serious detrimental effect on safety and overtreatment. However, one possibility is that repeat treatment may be necessary to main good control of IOP. More investigation and long-term follow-up are needed on its application in NVG. There are some interesting phenomena in clinical practice with managing NVG. We observed that with the IOP having been controlled well after drainage surgery alone, the anterior segment NV in almost half (47%) of the patients would regress itself without any other intervention measure. However, if the IOP was out of control and rose again, those iris new vessels turned out. The reason is still unknown. There are our assumptions concerning that it could be that neovascularization-related factors have been drained out of the eyeball soon after the surgery; the surgery also has improved the ocular blood and oxygen supply as lowering IOP; or probably the microenvironment of NV has changed. As we know, VEGF is produced locally in the human eye by a variety of cells including Müller cells, retinal pigment epithelial cells, retinal capillary pericytes, endothelial cells, and so on. Moreover, it has also been testified that intravitreal injection of anti-VEGF agents has no effect on neovascular distribution despite reports indicating the disappearance of newly formed vessels examined using a slit lamp. Actually through FFA and ICGA, it was found that the neovascular structures were still present there post-anti-VEGF injection. However, their fenestrations disappeared so that permeability decreased. Meanwhile, these vessels contricted and appeared as invisible under slitlamp. Therefore, here, we got another hypothesis: When aqueous humor outflow is blocked and IOP elevates again, it leads to the accumulation of NV-related factors in the aqueous humor up to the level that will arouse the “silent” neovasculature and then the neovessels reappear on the anterior segment. This means the microenvironment of neovasculature changes, then the underdeveloped endothelium and mural cells respond abnormally and dilate consequently, which make INV visible under slit lamp. There requires further researches on this field to provide us more evidence no matter supporting or denying it. NVG is still a challenging problem in clinical practice. One thing should bear in mind is no matter how it progresses in treating NVG itself, dealing with the underlying original diseases is the first priority. The effects and safety of any treating strategy call for strict assessment before a standardized guideline is set up. Anti-VEGF has been proposed to be established as a new way to improve the prognosis in these past years, however, it was showed to reduce neovaculature temporarily rather than eliminate the fibrovascular membrane totally. Maybe medicines targeting other-related factors such as TGF-β, HGF, or subtypes of VEGF would bring about new specific effects. We look forward to seeing more researchers step into the mechanisms of neovascularization of the eye from the clinical practice. For example, why has it never been found the neovascularization involving the pigment epithelium of iris even with obvious ectropion uvea by neovascular membrane contracting? There may have some hints for future research. The research work was financially supported by Grant 2017ZZ01020 from Shanghai. Hayreh SS. Neovascular glaucoma. Prog Retin Eye Res 2007;26:470-85. Jung YH, Ahn SJ, Hong JH, Park KH, Han MK, Jung C, et al. Incidence and clinical features of neovascularization of the iris following acute central retinal artery occlusion. Korean J Ophthalmol 2016;30:352-9. Lyssek-Boroń A, Wylęgała A, Dobrowolski D, Kowalczyk E, Polanowska K, Wylęgała E, et al. Evaluation of EX-PRESS glaucoma implant in elderly diabetic patients after 23G vitrectomy. Clin Interv Aging 2017;12:653-8. Kim YH, Sung MS, Park SW. Clinical features of ocular ischemic syndrome and risk factors for neovascular glaucoma. Korean J Ophthalmol 2017;31:343-50. Brown GC, Magargal LE, Schachat A, Shah H. Neovascular glaucoma. Etiologic considerations. Ophthalmology 1984;91:315-20. Al-Shamsi HN, Dueker DK, Nowilaty SR, Al-Shahwan SA. Neovascular glaucoma at King Khaled eye specialist hospital-etiologic considerations. Middle East Afr J Ophthalmol 2009;16:15-9. Kwon J, Sung KR. Effect of preoperative intravitreal bevacizumab on the surgical outcome of neovascular glaucoma at different stages. J Ophthalmol 2017;2017:7672485. Woodcock MG, Richards JC, Murray AD. The last 11 years of molteno implantation at the university of cape town. Refining our indications and surgical technique. Eye (Lond) 2008;22:18-25. Liu L, Xu Y, Huang Z, Wang X. Intravitreal ranibizumab injection combined trabeculectomy versus ahmed valve surgery in the treatment of neovascular glaucoma: Assessment of efficacy and complications. BMC Ophthalmol 2016;16:65. Yu XB, Sun XH, Guo WY, Qian SH. The etiologic considerations of neovascular glaucoma. Chin J Ophthalmol Otorhinolaryngol 2004;5:291-3. Yu XB, Sun XH, Dahan E, Guo WY, Qian SH, Meng FR, et al. Increased levels of transforming growth factor-betal and -beta2 in the aqueous humor of patients with neovascular glaucoma. Ophthalmic Surg Lasers Imaging 2007;38:6-14. Tripathi RC, Borisuth NS, Tripathi BJ. Detection, quantification, and significance of basic fibroblast growth factor in the aqueous humor of man, cat, dog and pig. Exp Eye Res 1992;54:447-54. Fekrat S, Finkelstein D. Current concepts in the management of central retinal vein occlusion. Curr Opin Ophthalmol 1997;8:50-4. Wakabayashi T, Oshima Y, Sakaguchi H, Ikuno Y, Miki A, Gomi F, et al. Intravitreal bevacizumab to treat iris neovascularization and neovascular glaucoma secondary to ischemic retinal diseases in 41 consecutive cases. Ophthalmology 2008;115:1571-80, 1580.e1-3. Shen CC, Salim S, Du H, Netland PA. Trabeculectomy versus ahmed glaucoma valve implantation in neovascular glaucoma. Clin Ophthalmol 2011;5:281-6. Feldman RM, el-Harazi SM, LoRusso FJ, McCash C, Lloyd WC 3rd, Warner PA, et al. Histopathologic findings following contact transscleral semiconductor diode laser cyclophotocoagulation in a human eye. J Glaucoma 1997;6:139-40. Rodrigues GB, Abe RY, Zangalli C, Sodre SL, Donini FA, Costa DC, et al. Neovascular glaucoma: A review. Int J Retina Vitreous 2016;2:26. Netland PA. The ahmed glaucoma valve in neovascular glaucoma (An AOS thesis). Trans Am Ophthalmol Soc 2009;107:325-42. Yalvac IS, Eksioglu U, Satana B, Duman S. Long-term results of ahmed glaucoma valve and molteno implant in neovascular glaucoma. Eye (Lond) 2007;21:65-70. Noor NA, Mustafa S, Artini W. Glaucoma drainage device implantation with adjunctive intravitreal bevacizumab in neovascular glaucoma: 3-year experience. Clin Ophthalmol 2017;11:1417-22. Nakano S, Nakamuro T, Yokoyama K, Kiyosaki K, Kubota T. Prognostic factor analysis of intraocular pressure with neovascular glaucoma. J Ophthalmol 2016;2016:1205895. Slabaugh M, Salim S. Use of anti-VEGF agents in glaucoma surgery. J Ophthalmol 2017;2017:1645269. Wen JC, Reina-Torres E, Sherwood JM, Challa P, Liu KC, Li G, et al. Intravitreal anti-VEGF injections reduce aqueous outflow facility in patients with neovascular age-related macular degeneration. Invest Ophthalmol Vis Sci 2017;58:1893-8. Van Bergen T, Vandewalle E, Van de Veire S, Dewerchin M, Stassen JM, Moons L, et al. The role of different VEGF isoforms in scar formation after glaucoma filtration surgery. Exp Eye Res 2011;93:689-99. Ishibashi S, Tawara A, Sohma R, Kubota T, Toh N. Angiographic changes in iris and iridocorneal angle neovascularization after intravitreal bevacizumab injection. Arch Ophthalmol 2010;128:1539-45.